There are 34 reviews of Paris Hilton. Paris Hilton's concoctions are a marketing coup. They are perfectly appropriate for their teen demographic; the packaging and "image" are a bit edgy, but the scents themselves are completely safe. Light, unremarkable, but pleasant enough; I would rather spend more money and get better quality, but for the price, it's pretty decent. Especially if you are a star-struck teenager. I am not, but even I can't complain about the scent - it's well-done, if light (even in EDP strength). If you want to wear a barely-there perfume and don't mind simple scents, this is a nice aquatic-fruity-floral that doesn't overwhelm. Nice as a room spray, too. Cons: Not what I would call "real perfume""
It smells like the last, lingering waft of the perfume aisle. Pretty, subtle, nice. A sweet and musky, yet clean and unobtrusive scent- not especially distinguishable. Not sophisticated or luxurious, a casual and inexpensive scent that smells good. I used to wear this fragrance everyday as my signature scent. 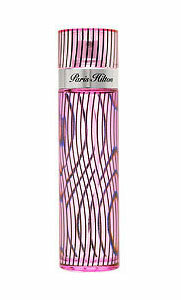 I enjoyed the fruity sweet scent with a very minimal hint of floral, it made me feel optimistic and teeny boppy young. My friend liked it so much on me, she bought one herself. However, now that i own more fragrances, i have come to realise how it does not compare to other fragrances that are on the market. The bottle design is very cheap though. The black wiggly lines you see on the bottle is actually a clear sticker with the lines on it, wrapped around the bottle. Not very impressive on the dresser and i sense the intended audience was for a young teen, still in school and still going through puberty. I think it would appeal more to young girls who are just discovering perfumes who are into a medium sweet fruity fragrance. It's not absolutely terrible...but it does not compare to other fragrances that are out there. Top notes include frozen apple, peach nectar, wet ozone and muguet, with heart notes of freesia, mimosa, jasmine and tuberose. Base notes combine skin musk, sandalwood, ylang-ylang, oakmoss and pheromone. I received this perfume as a gift, and I must say I'm not a fan. It's a rather odd fruity fragrance in that it isn't citrusy or sour, yet it isn't sweet either. It's more of a tart-like floral. I have tried to like this scent, but I have concluded that I just don't like this perfume at all. In some ways it reminds me of halved peaches that you buy in the cans. Not something that I aspire to smelling like. The lasting power is quite good and the scent is rather refreshing and clean smelling, so perhaps it will appeal to some. If I had to recommend this perfume, I would suggest it to teens seeming that it is inexpensive and fruity. Whound anybody like have a hot cup of Cappuchino toppled with Fruits. doing a dog rescue hand off from brooklyn to upstate, a 5 week old husky pup had just pissed and crapped all over my small, carpeted apartment. "you smell like you just took 9 million showers"
she reluctantly told me what it was and that her mother had bought it for her. it's not something i could wear. but "clean" does not begin to describe it. for this pin straight blonde with perfect clothes and husband and daughter and car -- this is the smell she should always lilt along in. There are no member images of Paris Hilton yet. Why not be the first? NEW: Paris Hilton - Rose Rush For Women! NEW: Paris Hilton - Can Can Bling Edition For Women! Admit it, who here owns any of the Paris Hilton scents?